Leogane, Haiti. Another early day here in Leogane, Haiti — epicenter of the earthquake — for our international NGO post-disaster relief team. I brief the team over breakfast at 7am and by 8am we are at the U.N. Coordinating Committee compound to continue our introduction to them. 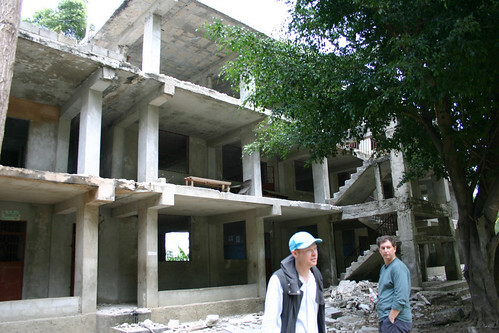 Known as “OCHA,” this U.N. branch is connecting the disconnected relied efforts after the earthquake. 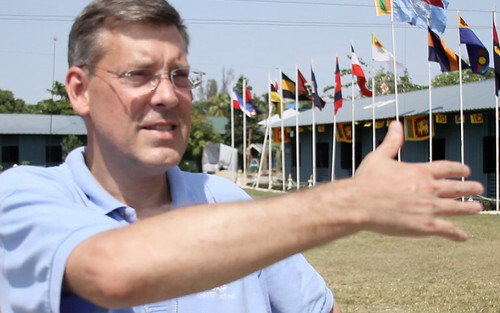 We say hello to UNICEF and Save the Children leaders, and then head for the U.N.’s MINUSTAH command center – where the almost 1,000 Sri Lankan peacekeepers under the leadership of Commander Colonel Jayanath Jayaweera, Lt. Colonel Wasantha Herath, and Major Dalsara Dharmsena. 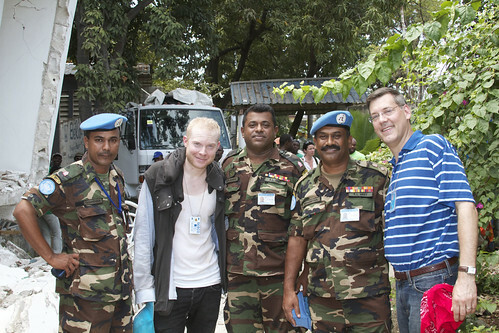 At the MINUSTA Base in Leogane, home of Sri Lanka’s U.N. troops. We begin the meeting with the major and then are introduced again to the lieutenant colonel, and finally to the colonel and base commander. Commander Colonel Jayanath Jayaweera has an incredible story that I look forward to telling soon. Having been in Sri Lanka many times after the Tsunami, I was delighted to chat about coastal villages in and around the city of Galle in the Southern province of Sri Lanka. Last month, Orphans International Worldwide (OIWW) presented the Sri Lankan Ambassador to the U.N., Dr. Palitha Kohona, our Global Citizenship Award in New York. We are meeting with friends, and our friends immediately offered to do anything in their power to make our mission a success. Loading into U.N. military vehicles, we led a convoy to our new partner school, a three-story structure still standing that had surprisingly escaped the U.N.’s radar. The commander was shocked and delighted that a structure so marvelous had survived, and pledged his forces to help clean the minor debris and make minor repairs. Surveying our new site with the U.N. Commander, where we have partnered with a local school. The U.N. team, surrounded by blue helmets with machine guns, surveyed our new site and proclaimed it both highly secure and in a safe location. Although we wait a final written engineering report, MINUSTAH leadership agreed with the engineer’s report that the building was structurally sound. MINUSTAH promised to be the conduit for all supplies we will need to ship to Haiti, including tents from China, computer equipment from the U.S. and Europe, and other technology from Japan and Korea. This will help us by-pass the incredible corruption and thievery of the international airport and get much-needed supplies into the hands of Haitians in need. I am particularly fond of MINUSTAH because in another sector of Haiti, after Hurricane Jeanne, I was almost killed by a riot sparked by miscommunication. The police attempted to rescue me, but they themselves were overrun by the crowd. 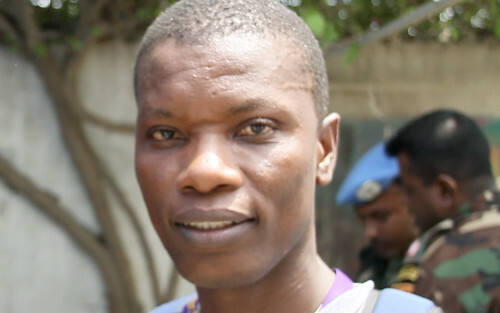 MINUSTAH, French-speaking West African troops in that sector, came in to rescue me and the police both. I wrote about this frightening experience for the BBC (here). At the school, our new base in Leogane, we were delighted to meet our latest partner – the Korean International Cooperation Agency (KOICA), working through the NGO Good Neighbors, led in Haiti by Kyung-hoo Roh. Kyung-hoo and I hit it off immediately. As a graduate of the prestigious Yonsei University in Seoul, it turns out he is familiar with the Luce Chapel located there. Small world! one of the few three-story school buildings that survived the earthquake anywhere in Haiti. Returning to our original base camp at the water company, we began the second interview of the original 200 applicants for our four-year full scholarships to a college in Beijing. We have narrowed yesterday’s 200 applicants down to 50. We have budgeted for 40 college scholarship positions, where we will train them here in Leogane for one year in English and Chinese. Our former Orphans International Worldwide Haiti director, Phadoul Amisial, has arrived from Port-au-Prince. He has agreed to serve of our NHO partnership Advisory Board in Leogane and helps throughout the interview process, conducted in English, French, and Creole. Phadoul has a background in both child psychology and business administration and serves as administrator of one of Haiti’s best pediatric hospitals in the nations’ capital. Phadoul travelled with me to Indonesia to train there with Orphans International Worldwide years ago and is a frequent guest of ours in New York. 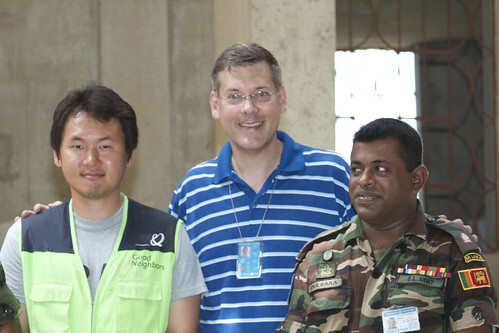 Former Orphans International Worldwide Officer Phadoul Amisial with U.N. commanders in background. One of the applicants that passed Phadoul and the team easily was a medical student at one of Haiti’s top medical schools. When the earthquake destroyed virtually all universities across Haiti, he suddenly had no medical school to return to. Many other applicants had also begun university here, in the fields of computer science, civil engineering, business administration, nursing, and agronomics. Ten of the 40 will theoretically go on after a year to four years full scholarship in Beijing. We have finally chosen 23 men and 17 women for the 40 spots, but still continue to finalize second interviews with a few stragglers. We are trying to have as many women as men. I interview one particularly engaging but inappropriate applicant for this process on video as he has already graduated from university in education and is looking for a Masters degree scholarship. Hopefully, someone in admissions somewhere in the world will be able to help this bright man named Remy. Before the trip is over I will run into people affiliated with the University of Toledo from my home state of Ohio and we chat about scholarship possibilities that might be possible at that fine institution. The couple are actually in Leogane to finalize the adoption process for a beautiful teenage girl that they had started before the earthquake. Luckily, the girl survived. We meet in the pitch black night, at a table lit by flashlight. Our team discussed assisting with traditional high school academic curriculum, as well as potential high school and college vocation training. We will continue to work out the details, but shook hands to make a move into the school immediately. will locate our efforts and resources to do our part in the reconstruction of post-earthquake Haiti. We shook hands on deal to have Orphans International Worldwide Haiti locate in the three story school and run orphan family-care in Leogane, along with our multiple NGO and corporate sponsors providing auxiliary programming. Another 15-hour day ended. We are in Haiti to help and help we shall to the best of our abilities. Photos by Morgan Freeman. Originally published in The Daily Kos, April 3, 2010.